Rehearsal Log: WEEK 8! — A.B.L.E. Spring break is over and we only have one month left until our performance of Twelfth Night May 28th at Chicago Shakespeare Theater! 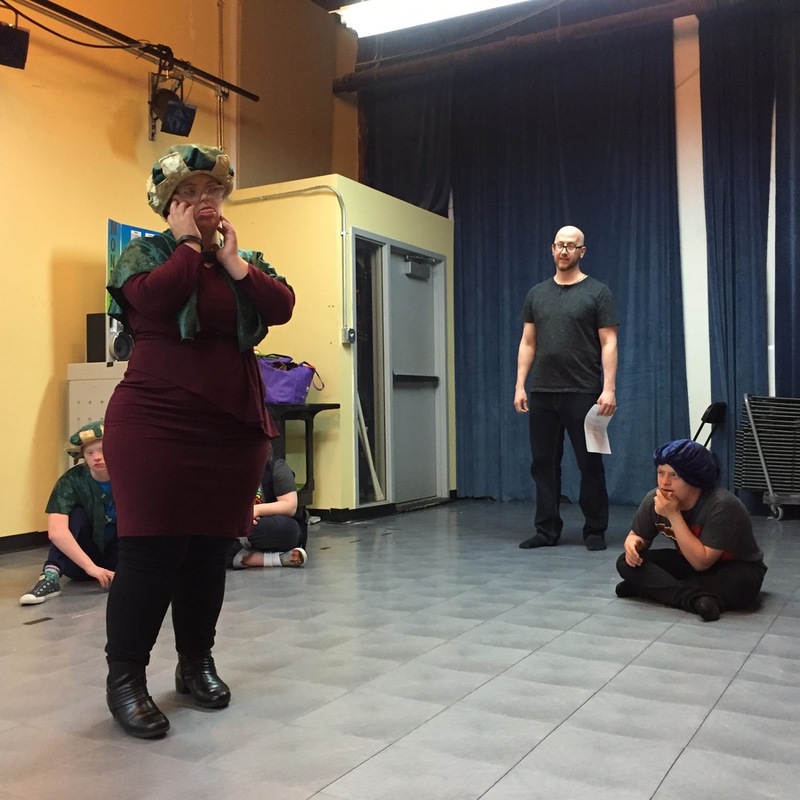 Now that roles have been cast, our remaining rehearsals will focus on blocking scenes, staging our group numbers, and practicing all the other elements of the show. Lucy walks the runway during dance party. Our ensemble came in with great energy tonight - refreshed from spring break and excited to dive into work! After some high energy at the dance party (and an impromptu fashion walk-off from Lucy), it was time for vocal and physical warm-ups. (Editor's Note: Sean is too humble to say how cool his warm up was, but it was awesome! We pretended we had a little buzzing ball of energy it could travel throughout our bodies changing sizes and sounds as it went. We had a lot of fun shaking and buzzing and moving through our bodies!). our schedule for the night! Once we were all warm, Katie pulled the schedule off the wall and after perusing it we went around the circle answering our check-in question: “What did you do on your spring break?” Everyone was excited to share news of their vacations and activities. Between trips to New Mexico, Florida, Michigan, Arizona and various weddings, movies, and picnics it sounds like a good time was had all around. Being caught up with our ensemble Lawrence took us through some vocabulary words and practiced the first one, “Levels.” We played a version of "Make A Scene" in which 3 people would create a scene like being at the beach or at school, but with the challenge of having to use different levels. In every scene one person had to be standing, one sitting, and one lying down. It was tough but soon our actors were creating stage pictures like pros (everyone loved Claire’s solution of taking a nap at school). On to the play proper as we broke into groups to create tableaux of our first official scenes for Twelfth Night. We worked with our scene partners to create three tableaux for every scene - the beginning, middle, and end - as a way to really analyze the moments of those scenes. Fletcher captured the instant that Duke Orsino asked Cesario to win the love of Olivia on his behalf. Orsino then pined up stage as Lucy broke our hearts revealing Viola’s love for the Duke. Ben and Hannah showed us unique characteristics and the strong friendship of Antonio and Sebastian. Next up Emily Lavin as Malvolio showed Rachel’s Cesario much disdain. Sam, Colleen, Ariel, and Claire plotted the downfall of the much hated Malvolio. When we get to the actual performance, we'll have a clear milestones for the beginning, middle, and end of each one of our scenes! We closed out the night by spending some quality time with the lyrics to Hey, Ho, the Wind and the Rain, which is starting to meld together with the choreography. After checking out, we Took from the Heavens (led by Ben) and headed home. Our Friday Night Class also worked on Tableaux for some of their final scenes, and had a great time celebrating International Dance Day during Dance Party! We only have 3 regular rehearsals left before we tread the boards at CST for dress rehearsal! Check back every Monday to get updates on our rehearsal progress, and don't miss our Friday blogs where we introduce you to members of our ensemble!